P.S. I Love You is the advocacy organization for Petite Sirah. 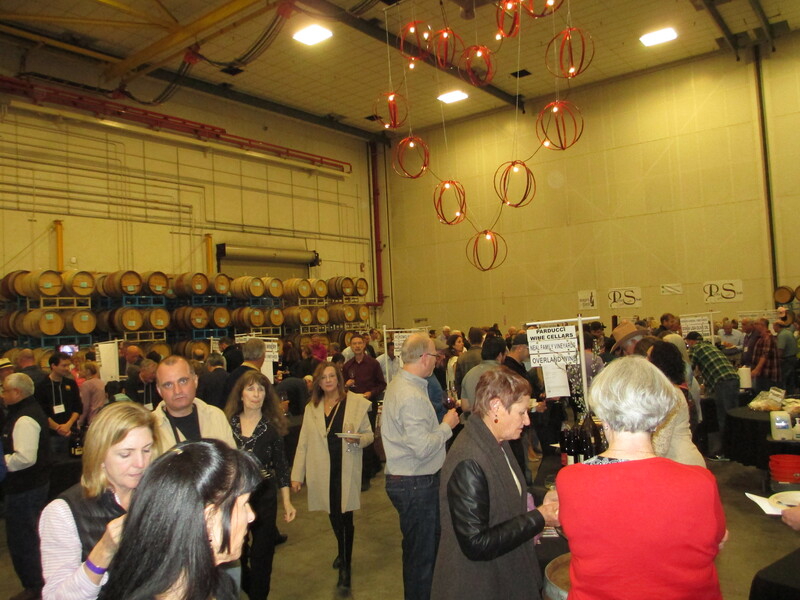 One of their major events each year is Dark and Delicious, an event featuring Petite Sirah producers which also includes various food vendors. It takes place mid-February, this year hosted by Rock Wall Wine Company in Alameda. 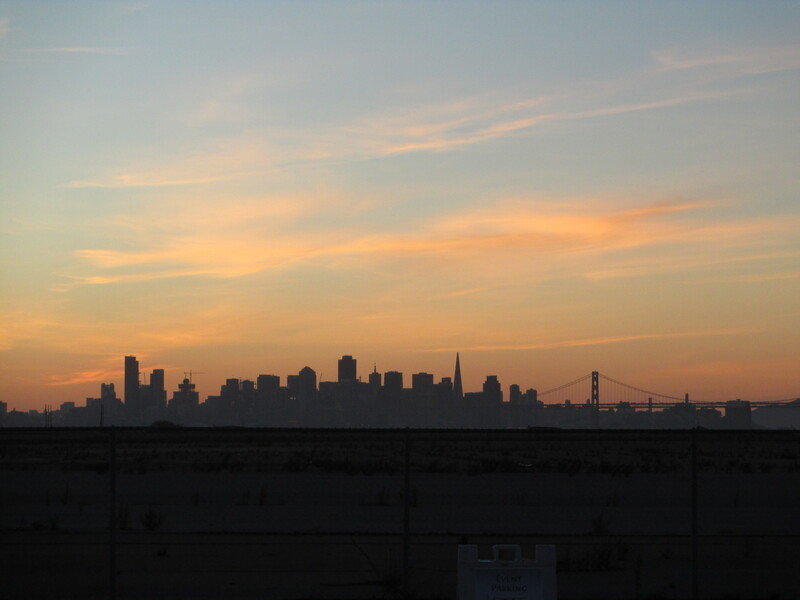 It was a beautiful evening, and the view of San Francisco from the northern end of the island (Alameda) was spectacular, as you can see from the photo above. So in we went, ready to take on the over 50 different wineries and dozen plus food vendors. Rock Wall’s barrel room, which is where the event is held, is an old hangar from the Alameda Naval Air Station which used to be there. Big room, big enough so the 1000 or so barrels they have in there don’t seem like so many. I had to do the math twice to be sure: 4 high by 4 deep by 20 wide by 3 walls, plus another 20-40 against the 4th wall. That’s a lot of wine! We tasted, and tasted, and tasted some more. Petite Sirah is an interesting grape. Primarily used in California as a blending grape to add more body and structure to Zinfandel, it is a big flavored grape, with lots of tannins. It is usually grown in warm climates, like many of the Zinfandel regions. For example, Napa Valley at the northern end near Calistoga, the Sierra Foothills, Lodi in the San Joaquin Valley and Mendocino County (inland areas). Given the large flavors that develop, it can often be difficult to get everything in balance: nose, fruit, body, finish. Also, since Lori and I have very different palates, we often see these differently. However, the Petite Sirah from Lava Cap Winery in El Dorado County (Sierra Foothills) was the clear winner for both of us. Not the biggest, baddest Petite Sirah of the evening, but the one with the best balance, where everything came together in the right proportions. Lava Cap has been around for more than 25 years. We first came upon them about 22 years ago, when we went on passport weekend to El Dorado County for our first time. We were quite impressed by their Zinfandel at the time. One of my best wine/business stories is about taking a customer from France to a nice steak house in Silicon Valley. Thinking that it could be awkward to order a California version of a French varietal, I went with the “native” California varietal wine, Zinfandel. From Lava Cap. While my French sales rep looked on in trepidation, the customer loved trying something new, something very good. He shoots, he scores! A few other wines deserve mention as well. These were very good, just not quite as good as the Lava Cap in our oh-so-humble opinion. An interesting note, looking at the list, is that Lori and I have visited every tasting room except Theopolis, which is relatively new to the scene (first time at Dark and Delicious?). These are actually some of the best tasting experiences for one reason or another. •	Artezin Wines:	Currently they share the tasting room at the Hess Collection in Napa Valley. The art collection and the gardens at Hess are amazing. •	Gustafson Family Vineyards: At the northern end of Dry Creek Valley, Gustafson takes an effort to get there. Friendly staff, beautiful setting and an interesting building, not to mention the wines, make the drive worthwhile. •	Ridge Vineyards (specifically liked the Dynamite Hill Petite Sirah): Probably the most interesting architecture for a winery and tasting room, very eco-friendly. •	Sones Cellars (specifically liked the Santa Cruz Mountains Petite Sirah): Very small tasting room on the west side of Santa Cruz, with other tasting rooms and restaurants around. Small tasting room, but big heart. 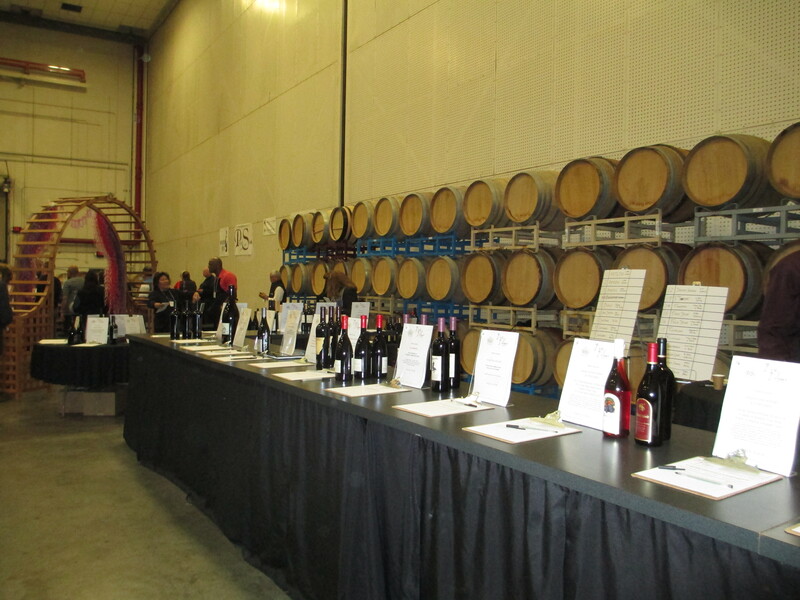 •	Theopolis Vineyards: Sorry, we had never been there, never heard of it before this event, but liked the wine! •	Tres Sabores Winery: Napa Valley, old house, cave cellar, biodynamic vineyards with animals running around (pea hens and sheep are what I remember). The event also features a silent auction as a fund raiser for the organization. You can usually find great deals if you look hard enough, and then guard your bid. 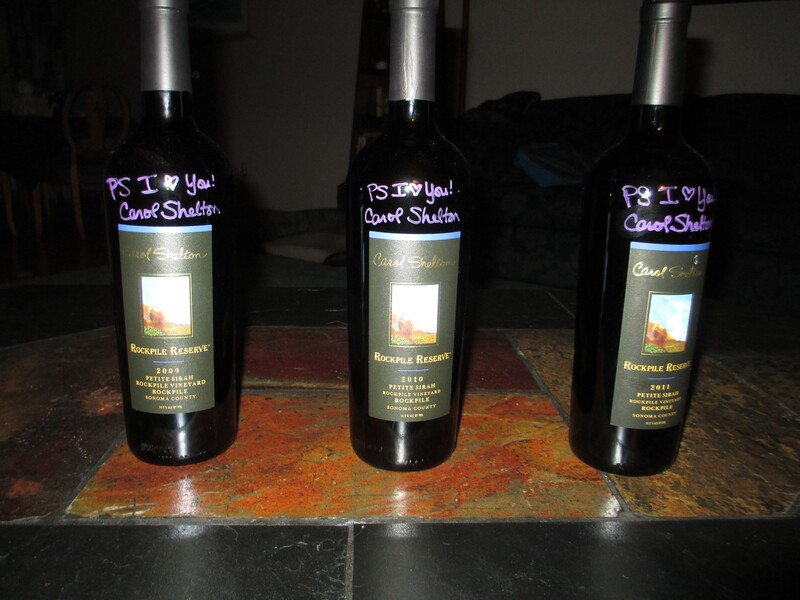 This year it was a vertical of Carol Shelton Winery Rockpile Petite Sirah, from 2009, 2010 and 2011. We’ll let that sit for another year or so, then open together. Interestingly enough, we didn’t get to taste any of the Carol Shelton Petite Sirah at the event, however, we’ll go on faith and reputation of the winery and vineyard. We’ll let you know how it tastes when we open the bottles! This entry was posted in wine tasting and tagged Dark and Delicious, Lava Cap Winery, Petite Sirah on March 7, 2015 by vvblogman.